While Microsoft was quick to announce Internet Explorer 9 gained significant ground in usurping IE8 on Windows 7, the latest numbers from Net Applications and StatCounter write a richer story than the company was willing to tell. There is no question about it: IE still reigns supreme when all desktop platforms and browsers are considered. 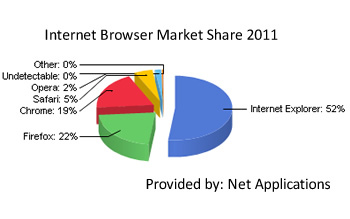 However, IE continues to shed users as Chrome chews into its once monopoly-worthy market share. Chrome leads the charge against Microsoft's hold, boasting the fastest growth of any browser with a yearly increase of more than 84 percent. Google's browser seems to be the browser of choice for 22-27 percent of Internet surfers, according to the data provided by both analytical firms. Similar to IE, Firefox also continues to slip as users defect to Chrome. While Net Applications' figures show Firefox on equal footing with Chrome at 25% market share, StatCounter has already declared Google's victory by a few percentage points. Regardless of which analysis you look at, this much is clear: Chrome's rise to the second most popular browser is imminent. However, even with Chrome's rapid growth and IE's almost equally rapid decline, it may still be a couple more years before IE finally loses its crown. As older version of IE fade into obscurity, support for IE7 also continues to wane. Facebook has joined the likes of Google, YouTube and a growing list of other websites who no longer support IE7 as the company's new "Timeline" feature does not work properly under the aging browser. Meanwhile, Facebook recommends using the "most up to date" version of Firefox, Chrome, IE or Safari.